Great Oaks takes great care of my mom. They're close to my house and not too big. They seem very professional, and everything is clean and bright. There is an activity every day. My mom participates, so I think their activities are great. Well, I wouldn't call it exactly reasonable because not everybody could afford it. However, I don't mind paying for what good service they have. I'm happy with what they provide. They're well-staffed and don't really overcharge, so they do give value for what you pay. JM, Thank you for the great review. We thank you for letting us take care of your Mom and are so happy that you love our community! We are here to to provide you with comfort and peace of mind and letting Great Oaks become a place you will love to call home for your mother! My visit at Great Oaks was good, but it was not what we were looking for. They had small rooms with a bathroom. The staff was very nice, friendly, and pleasant. Thank you Laurie for touring Great Oaks and the nice comments you made about my wonderful staff. The room you described is Great Oaks' Alcove or Studio Suite. This is a one room suite with a private bathroom, almost 400 sq feet, and has a kitchenette option. We also have a larger Deluxe One Bedroom Suite floor plan at Great Oaks. This larger floor plan is over 700 sq feet with a living room, kitchenette, bedroom, private bathroom, and the option of an outside porch. I apologize that you were not shown this larger floor plan during your tour. If you are interested, I would be happy to show it to you. Thank you again for visiting Great Oaks! Great Oaks Assisted Living and Memory Care is a very nice community, and they have been very kind and helpful to Mother. The place is very clean and well-kept. The rooms are very large and nice and have individual heating and air for each room which is a big plus. Great Oaks looked fine overall. The staff who gave us the tour was very good. The rooms were very small. Thank you for your interest in Great Oaks. We are so glad you enjoyed your tour! We would like to invite you to come look at our other floor plans such as the Deluxe or Deluxe with a patio; these floor plans offer two separate rooms for a living area and a bedroom area. Please feel free to contact me via email to set up a tour to explore our many options. Thank you again for your interest and for your feedback! We truly appreciate you! I visited Great Oaks a couple of years ago when we first started looking. The thing I didn’t like about Great Oaks is that it was two-stories and not all on one floor. Other than that, it seemed fine, and we liked a lot of it. The facility looked very nice and welcoming from the outside, and the entrance inside was very pretty but I must say I was very disappointed because I thought I was going to get a tour but that wasn't the case. The lady I spoke with was very nice and answered my questions but all I was given was a brochure with a general breakdown of what was covered as well as a calendar that showed planned activities for the residents. I was hoping to at least get to see what one of the cottages looked like but didn't. I wasn't shown anything and left rather disheartened so I really have no idea how the place is actually ran. Our experience with Great Oaks has been very good. They seem to be very attentive, and it is a very nice facility. We chose it because it is a family owned business rather than a corporate business and the convenience for me to be able to visit. They have independent living, assisted living, and memory care. It was very nice, very peaceful, and very well maintained. We have eaten there, and the food is very good. I looked at Great Oaks and they were a little expensive. It was more like an apartment. All of the rooms had kitchenettes. Their rooms were more upscale. It is beautiful, but it didn't feel homey. They had newer furniture, nicer flooring, but the custom service wasn't there. To me, that's what's most important. It was a big facility. It was very clean. The staff and rooms were very nice. They had a lot of activities for the people to do. They had trips and outings. They had karaoke night. They had pool table. I also liked the facility because they can administer insulin to my mom who was diabetic. Great Oaks was a nice place. The staff were friendly when I came to visit. It had a good reputation. The residents seemed happy. It just did not meet my needs. its a great place to live, they have frequent activities and a very nice and expert staff that will take care of any needs you may have. The rooms are nice and spacious, and the entire facility is kept clean and maintained. Both Southern Plantation & Great Oaks assistant living homes were just wonderful. They treat their guests with great respect as well as their residents. It feels really good to know that my grandpa is taking very well cared for. I like the fact that I can go home knowing that Great Oaks will be checking on him every couple of hours and that he will be fed three meals a day. I love how the faculty enjoy their job, enjoy spending time with the residents, and making the residents feel at home. One thing I loved about Southern Plantation is they want to make every day a spectacular day for the residents. They have where they'll bring chorus students from the near by school to sing for them and get to know the residents a little more.It warms my heart up to see my grandpa have someone to talk to as well as other senior citizens who don't have any relatives or friends that come to see them. Both Southern Plantation & Great Oaks are high class assistant living homes. They have great food, wonderful staff, clean cafeterias, clean bathrooms, & they keep the residents rooms clean as well. I also really feel welcomed. they're southern hospitality is so inviting. One other thing that I love is that I know whether my grandpa stays at Great Oaks or Southern plantation he will be safe and nothing will be stolen from him either. Great Oaks has built a home that is elegant and inviting. It is large enough to create a warm and lively atmosphere bustling with a variety of activities yet intimate enough that we provide quality, individualized care. You can dine with us, enjoy fun and stimulating activities, play billiards or enjoy a movie, and of course, relax and unwind on one of our many verandas. There's always something for you to do at Great Oaks. Great Oaks recognizes the special needs of people with memory impairment. We have designed The Gardens of Great Oaks with this in mind. Our residents are surrounded by a safe and peaceful environment that allows them to function at their maximum potential. 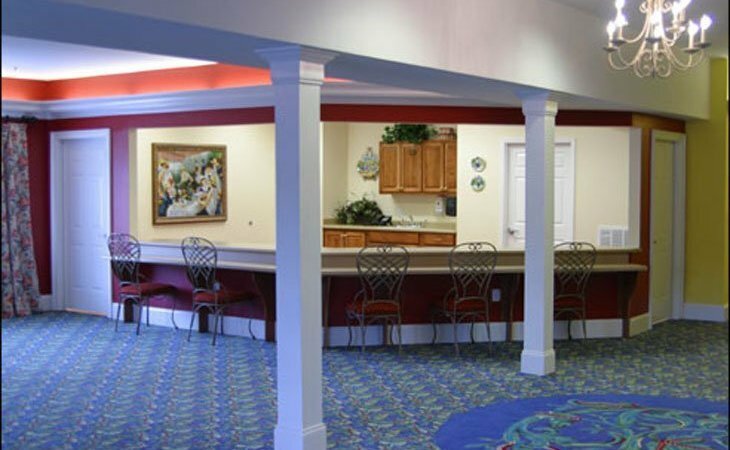 The Gardens care services are custom designed to meet the specific needs of each resident based on their cognitive and functional abilities. Our goal is to provide excellent support services for every resident allowing them to lead a fuller and more enjoyable life. The Gardens has two areas for memory support - one for the resident with moderate memory impairment and another, more intimate area for the resident experiencing more severe dementia and Alzheimer's. What should caregivers and potential residents know about Great Oaks Assisted Living and Memory Care?